The first thing to note is that the Kindle is not the first e-book reader. Its basic functionality can be found in similar devices from Sony and other manufacturers. The difference with the Kindle is in the delivery of content to the device. 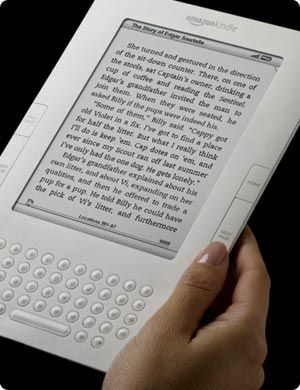 The Kindle is not just an e-book reader, but also a wireless Internet device with hooks into Amazon's online catalog. This design allows Amazon to provide Kindle owners with instant access to books, magazines, newspapers and blogs all without the need to be tethered to a desktop computer. This network, called Whispernet, allows Kindle users to search, sample and purchase these items through the Amazon store. One feature that many Kindle users find valuable is the ability to sample a book before purchase. The first chapter of every book sold on the Amazon Kindle store is also available for free. Just look up a book and click the send sample button, and within minutes you will have it on your Kindle. I use the feature quite a bit. I find myself listening to authors discussing books on a radio program and then look for the book and sample the chapter. This is a great way to try before you buy. The Kindle 2 weights just 10.2 ounces, so a reader can easily hold it with just one hand. Buttons located on either side allow you to turn pages. The design of the previous version made it easy to inadvertently turn a page. This issue has been addressed with the redesign. The Kindle 2 display measures 6 inches diagonally and the Kindle 2 utilizes an E-Ink electronic paper display which produces 16 levels of gray. Battery life in the Kindle 2 has also been improved. With the wireless turned on, you can read for up to 4 days on a single charge. With wireless turned off, the Kindle 2 will hold a charge for up to 2 weeks. Unlike the original Kindle, the Kindle 2 does not come with a case. Amazon offers a nice one, but it will set you back $29. Other features include a built-in dictionary (The New Oxford American Dictionary) with over 250,000 entries and definitions. You can look up a word by moving the cursor in front of the word, and its definition is displayed at the bottom of the screen. Audio books are also an option with the Kindle 2. Because of their size, audio book files are transfered from a desktop computer via USB cable. You can listen to audio books through the Kindle 2's built in speakers or through headphones. The Kindle 2 QWERTY keyboard allows you to annotate passages and take notes as you read. While not exactly the same as writing in the margins of a physical book, the notes are exportable. While Amazon has made it easy to access and purchase books, users can also access personal documents. Kindle supports conversion and delivery of files in the following formats: Microsoft Word, PDF, HTML, TXT, RTF, JPEG, GIF, PNG, BMP, PRC and MOBI files. This conversion of your personal documents can be accomplished by emailing them to a special email address. The converted documents can be delivered wirelessly to your Kindle for a small fee, or can be delivered to you via email and then transfered to the Kindle via the USB 2.0 connection. The Kindle 2 also comes with several features that Amazon describes as experimental. These include a basic Internet web browser and a text-to-speech feature called Read to Me. Basically, the Kindle 2 will read to you using mechanical text to speech conversion software. While not exactly the same as an audio book, this is an interesting approach to making text more accessible. This feature is only available on books where the publisher has expressly provided permission. While there is quite a bit to like about the new Kindle, one aspect that concerns some people is that books you buy from Amazon will only work on the KIndle. Some would like to see a more open standard that allows one to read their books on any device. Also, unlike analog books, you can't easily share them with others or resell them. I have found the experience of using the Kindle to be enjoyable and its portability and instant access to content make it an interesting alternative to other e-book devices and to traditional printed books, magazines and newspapers. Amazon has recently released and announced two new additions to the Kindle line. The Kindle DX is a larger from version of the Kindle 2. This version of the Kindle comes with a 9 inch screen. Some see this as a move on the part of Amazon to replicate the experience of reading large format content such as a newspapers or magazine articles. It also natively supports PDF documents, so things like reports and other formated content will display on the Kindle DX just as they would on a printed page. Also there is a move to provide textbook content via the Kindle DX. Five major colleges will be piloting the use of the Kindle DX on their campuses this fall. The Kindle DX is scheduled to be available mid June 2009. Another interesting move on the part of Amazon is the creation of a Kindle iPhone App for the Apple iPhone and iPod Touch. With this application, iPhone users now have access to the library of titles available through the Kindle store. You can have a copy of a book on both devices and with Amazon's Whispersync system, you can easily sync your place over both devices. For example, you can start to read a book on your Kindle, and then continue reading where you left off on your iPhone.